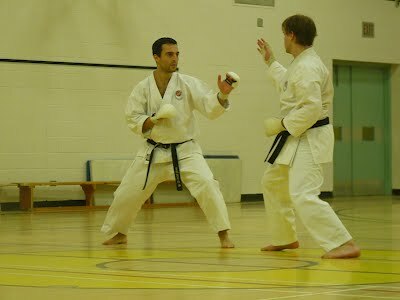 • Kihon – Learning and practicing basic techniques such as punching, kicking, blocking, stances, footwork, etc. • Kata – Often referred to as patterns. A series of set movements simulating defense against multiple attackers. • Kumite – Sparring practice with a partner. 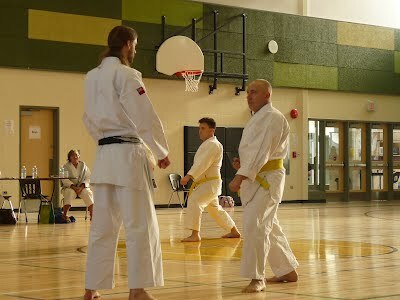 At Heijoshin Karate, we practice non-contact Shotokan Karate. What this means is that when practicing with others, forceful contact is kept to a minimum. When practicing punches, kicks, and strikes with a partner, techniques stop short of making contact with the intended target to prevent serious injury. Control is heavily emphasized. For adults, light contact is allowed when both partners agree to it. Students learn how to deflect attacks with minimal force. Karate is not about how big or strong you are, but more importantly how well you can use your body in an efficient manner. Although it is a relatively safe form of exercise, just like any other sport, accidents can happen. Please be careful and use control when training with a partner. We wear the traditional all-white uniform known as a do-gi (or just gi for short) and a belt. For beginners that do not have a gi, wear comfortable clothing that allows you to move freely. Typical gym clothing is fine, but please avoid clothing with exposed metal zippers since their zipper teeth can cut skin. Loose-fitting clothing such as t-shirts and shorts are recommended, but please do not wear items emblazoned with obsenities or any other inappropriate words or phrases. You should eventually purchase a gi to wear to class, since you cannot test for your next belt rank without a proper uniform. Uniforms are available for purchase from the club. No shoes. Traditionally, Karate is practiced in bare feet. Aside from customary reasons, we train barefoot because it is safer on your joints and ligaments. It also reduces the chances of injuring a partner during kumite (sparring). Please be sure to have your toenails and fingernails trimmed short to prevent accidentally cutting others. No jewelry. For safety reasons, please remove all rings, watches, necklaces, and piercings before training. A good rule of thumb is that if there is some possibility of someone getting caught on your jewelry, please remove or cover it to prevent catching. Medic Alert bracelets are allowed but should be taped to the wrist (with white hockey tape) or covered with a sweatband. If you have piercings that you are unable to remove, proper safety precautions should be taken to ensure they do not snag. 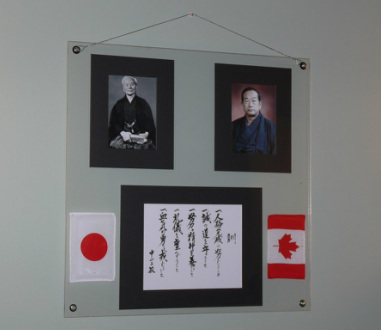 Washrooms are available and can be used for changing into your Karate uniform or gym clothes. Sorry, there are no showers available. Bring a towel and a bottle of water. Short breaks will be given during class where you can towel off or take a sip of water. No soft drinks please. Prior to the beginning of class students are expected to report to the instructor any relevant health issues that may affect mobility (sprains, back problems, knee problems, etc) or present a risk to the student’s wellbeing (illness causing shortness of breath, dizziness, etc). Out of courtesy for your fellow Karateka, students are expected to silence or turn off cell phones and pagers. If you are expecting an urgent call, are working on-call, etc, exceptions can be made. Please notify the instructor prior to the start of class.